Those switches are on different rows/columns. So I powered off and started looking under the playfield. I noticed a wire had come off of the knock down coil, so I resoldered it. When I powered up again, smoke started coming from the coil. Uh oh. I powered off after staring at the smoke coming up for a few seconds in horror. So I'm obviously going to need a new coil. The coil has no diodes, so... maybe a bad transistor? Any ideas on a root cause though? 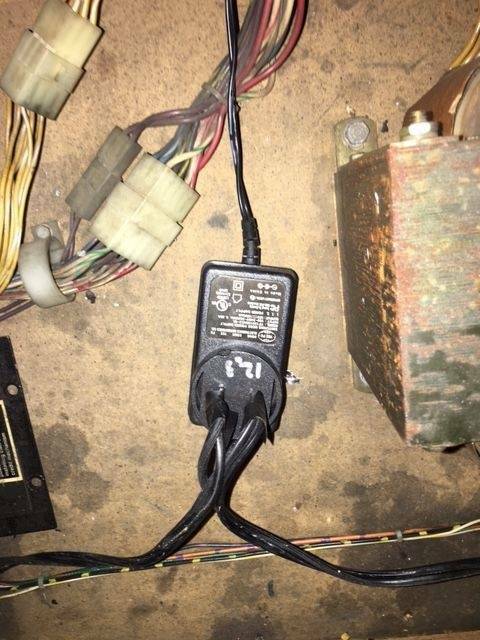 When I went to plug in my soldering iron and couldn't find a plug I also noticed this, shall we say interesting, hack job on the power as shown in the pictures. Just how worried should I be? O my.... that dont look nice lol. Remove all the hacks, fix original problem that hack was supposed to "fix". Most likely that is 5V-adapter that feeds MPU-board because Driver board is fried and can't keep up solid 5V line (=assumption). This means that DB might have problems with other voltages also and needs to be overhauled. Start with that. Fried coil is most likely shorted driver transistor (or pre-driver), replace both. Also test other components on that string also (resistors, diode etc.). I had T2 which had over 20 burnt resistors in different solenoid-circuits causing those to hang. Transistors were ok, it is still unknown to me what could cause that. But easy fix after other modifications were removed. 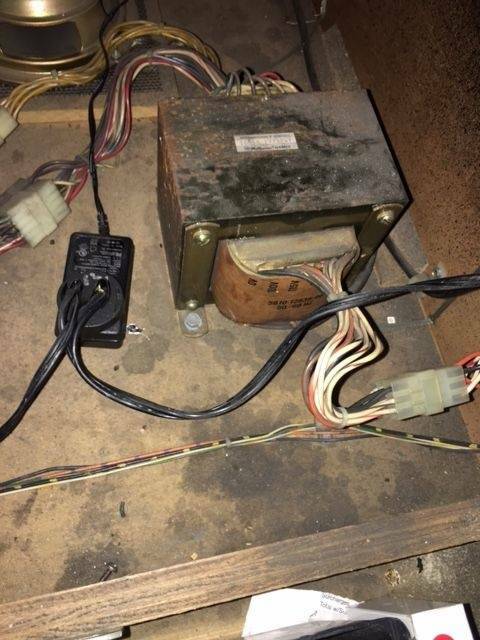 And what comes to those switch-errors, check switches first (wires, diodes, actual switch). Seems that your game has pretty high miles on it so it's pretty common that those switches fails at some point. If errors not found, check MPU about battery corrosion etc. Also check the schematic.. I am pretty sure the drop release coil on T2 has a tie-back diode associated with it. If this isn't hooked up all kinds of nastiness can result. 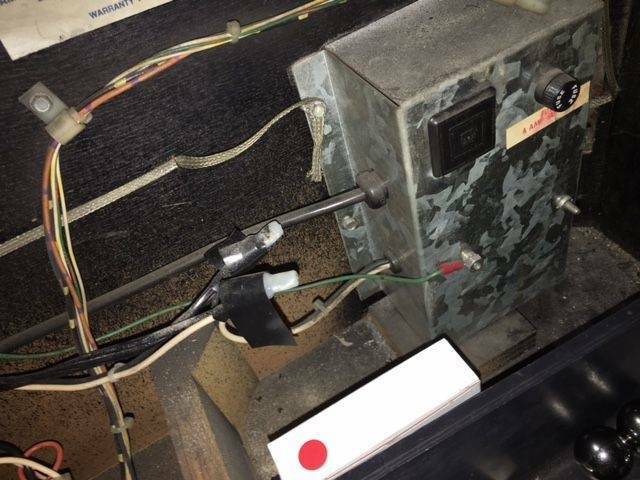 Diodes are in the Driver Board at WPC, not in the coils. But indeed those are there. Ok, so when I went back into T2 I left the wire that I thought had come off the knock down coil off. I fired up the machine and tried a solenoid test. The gun kicker wouldn't fire, so I resoldered a loose connection at the gun switch. Still didn't work, and a bunch of other solenoids weren't working which led me to fuse F103 being blown. After I replaced the fuse all the solenoids worked. So... what does the knock down coil do, anyway? I don't think it can be working, but gameplay doesn't seem to be affected at all. The knockdown coil will energize to free a ball stuck behind the target. Also maybe used to bring target down to make multi ball starting easier in various settings.